Take an out-of-this-world journey with the space program of the future! 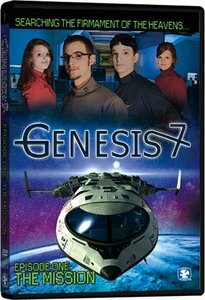 In the tradition of The Magic School Bus, this adventure-filled series educates young space cadets about the solar system as it follows the Genesis 7 spacecraft and its lander fondly known as "Little G." Piloted by Lt. Donton Andrews under the command of his uncle, Captain Enoch Andrews, and the captain's niece, imaging specialist Priscilla Andrews, the craft embarks on a year-long exploration of the solar system. Throughout their fact-finding mission, communications specialist Lt. Abby Jennings and her ground crew work hard from Genesis Command to ensure the team's success. On the maiden voyage of the Genesis 7, everyone is excited to see God's creation as never seen before. Their initial goal is to test all of the new systems in space and map the atmosphere of Earth, but soon the call comes in from Genesis Command to proceed to the moon and touch down on the lunar surface to look for water. However, shortly after Donton, Enoch, and Priscilla begin to drill, a gravitational anomaly affects the orbit of a piece of space debris that poses a serious threat to the mission and Donton's life. About "The Mission (25 Mins) (#01 in Genesis 7 Series)"